United Nations military personnel are the Blue Helmets on the ground. Today, they consist of over 90,000 military personnel contributed by national armies from across the globe. We work alongside UN Police and civilian colleagues to promote stability, security, and peace processes; we protect personnel and property; we work with local communities, and security forces promote lasting peace. In many missions, protection of civilians is at the heart of our mandate. Blue Helmets are protecting populations against threats and contributing to a secure environment. 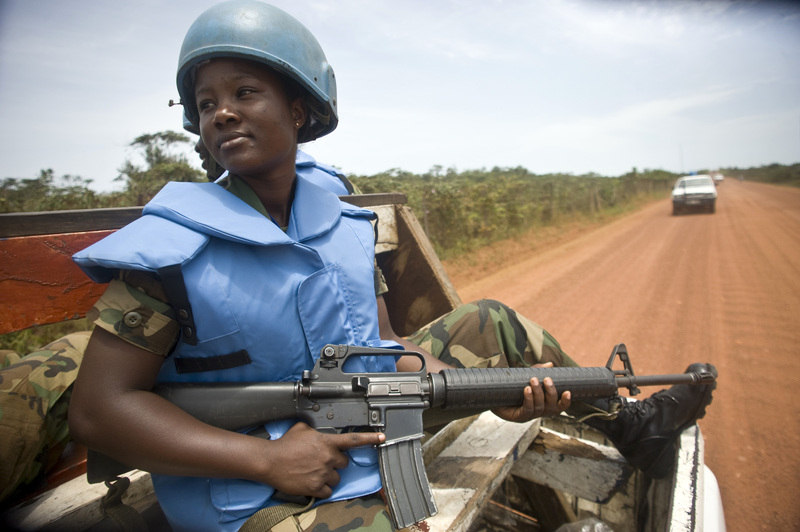 It is essential that we increase the representation of female military in UN peacekeeping operations. All military personnel working under the Blue Helmet are first and foremost members of their own national armies and are then seconded to work under the command and control of the UN. We have more than 100,000 UN uniformed personnel coming from over 120 countries. They come from nations large and small, rich and poor. They bring different cultures and experience to the job, but they are united in their determination to foster peace. Currently, the majority of troops come from African and Asian countries, while the contribution of western countries is increasing. The UN has been deploying military personnel for service in peace operations since 1948 when the Security Council authorized the deployment of UN military observers to the Middle East to monitor the Armistice Agreement between Israel and its Arab neighbours. Assist ex-combatants in implementing the peace agreements; they may have signed. One of the biggest changes UN Peacekeeping has seen over the 70 years of its existence has been the increasingly multi-dimensional nature of UN peacekeeping operations. UN military peacekeepers are often deployed in inhospitable, remote and dangerous environments where they face an unprecedented scale of challenges especially when protecting civilians, under asymmetric threats. Read more about how UN Peacekeeping is evolving to handle these modern day challenges here. The United Nations Office of Military Affairs seeks highly qualified military officers from UN Member States for service in our peace missions around the world, either as individual Staff Officers, as Military Observers, or as part of a formed unit from an individual Troop-Contributing Country. Staff Officers are also valued at UN Headquarters from where they support all aspects related to the deployment of troops on the ground. By the end of July 2018, 4 per cent of UN military personnel were female. A top priority for UN Peacekeeping is to increase the number of female military personnel in peacekeeping operations, including increasing women staff officers and military observers to 15 per cent by the end of 2018; currently 11 per cent of staff officers and military observers in peacekeeping operations are female. At UN Headquarters,18 per cent of military staff are women, exceeding the target of 15 per cent for 2018. Blue Helmets as members of their own national armies are seconded to work with the UN for periods normally of up to one year in the field, or two or three years at UN headquarters. Any queries about working for the UN in a military capacity should be addressed within an applicant's own country first. What kind of Blue Helmets are needed? The most common sort of UN peacekeeper is the infantry soldier. However, increasingly we need specialized personnel who we refer to as ‘enablers’. These skilled soldiers include engineers, who for example were able to help with the post-earthquake reconstruction in Haiti, or the building of new roads in South Sudan. We also need helicopters and their crews, as they enable us to extend our area of influence and be much more visible. Other specialist enablers include transport companies, communicators and medical personnel. Modern peacekeeping operations are often very complex, and place high demands on the personnel we deploy. High levels of training are required before deployment, and the UN works closely with Troop-Contributing Countries to provide the best help and advice possible. Troops must know what to do if they find themselves in an ambush, for example, and must be capable of responding appropriately. Does the UN have a standing reserve Force? It takes considerable time to deploy troops and we are often asked why we do not have a standing reserve. The UN can only deploy military personnel when there is a UN Security Council resolution authorizing them to do so. The Security Council will say how many military personnel are required, and UN Headquarters will liaise with the Member States to identify personnel and deploy them. This can take time – often more than six months from the date of the resolution to get boots and equipment on the ground. As former UN Secretary-General Kofi Annan said, the UN is “the only fire brigade in the world that has to wait for the fire to break out before it can acquire a fire engine.” A standing reserve sounds logical, but it would be immensely costly to have a force of several thousand people on permanent standby. Although it takes time, it is much more practical to generate the military personnel once the go-ahead has been given. This also ensures we recruit personnel with the appropriate background, training and language skills relevant to the place they are being deployed to. With these limitations in mind, since 2015 the UN has been working with Member States to develop a new arrangement called the Peacekeeping Capability Readiness System (PCRS). Through the PCRS, Member States can pledge to have specific units available for UN Peacekeeping. Far in advance of a possible deployment, the UN Secretariat will perform an assessment of the readiness of the personnel, training, and equipment of those units. Select units can also be pledged to the Rapid Deployment Level of the PCRS and will be made available within 60 days of a request from the UN Secretary-General. When fully operational at the start of 2018, this system should help reduce the deployment timelines of military forces for future mission start-ups. The deployment of female peacekeepers to peace operations significantly, contributes to achieving sustainable peace and the improved wellbeing of women and girls in conflict-affected regions. Security Council Resolution 1325 urges equal participation of women at all sectors of peacekeeping operations, including the military. This is also reinforced in the policy on gender equality by the Departments of Peace Operations and Operational Support and the guidelines for integrating gender perspective into the works of the UN Military (2010). Female soldiers perform in many functions and capacities, from command to frontline roles, while bringing an added value to military operations. Female soldiers provide an invaluable perspective in planning operations and in making key decisions, especially those affecting civilians, particularly women and girls. This is an operational imperative for a mission as it provides a holistic approach to meet its mandate in today’s complex and evolving peacekeeping environment. A female soldiers’ visibility can empower women and girls and increase women’s participation in the security sector. Some unique tactical skills female military personnel bring to this field include screening of female civilians and conducting of house searches in areas where it is not culturally appropriate for men to enter private spaces. Local populations in host countries often feel more comfortable liaising and sharing information with military troops that include women alongside men. By obtaining better information, we can better protect these communities. 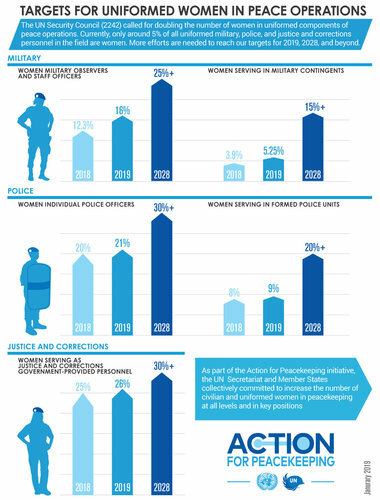 Find out more about women in peacekeeping, including recent statistics on their representation in peacekeeping operations. The Female Military Peacekeepers Network was created in April 2015 and so far about one hundred former and currently serving female military peacekeepers have joined the network. The network is an initiative of the Office of Military Affairs, with the aim of uniting female military who currently serve or have served in UN peacekeeping operations. The network promotes, strengthens and advances the profile of female military peacekeepers, and creates a space of mutual support, mentoring, training and advocacy for UN female military personnel. It allows women to share their experiences and encourages the participation of female military across all ranks in UN peace operations. You can request to join our Facebook group: “UN Female Military Peacekeepers Network”, or contact the local network group in your mission. The United Nations Military Gender Advocate of the Year Award recognises the dedication and effort of an individual peacekeeper in promoting the principles within the Security Council Resolution 1325. The Resolution provides three provisions, called the “3 Ps.” The first two “Ps” are “prevention” of conflict and “protection” of women and their rights during and after conflict. The third “P” is “participation” and refers to increasing the numbers of women in all mechanisms for the prevention and resolution of conflict. To implement their mandated tasks, our troops need to prepare adequately, starting sometimes far before deployment. This preparation covers every aspect of UN Peacekeeping such as ensuring the availability of the necessary and proper equipment. It is also critical that peacekeepers are properly trained, to name a few, in Protection of Civilians, the use of force, and the Rules of Engagement. Also, a thorough understanding of conduct and discipline is a key training requirement. Policies on readiness, performance, command and control. Protection of Civilians (POC) Implementing Guidelines for military component in peacekeeping missions (February 2015) provide clear objective for military component when it comes to POC. Rules of Engagement: This document provides authority for the use of force and explains policy, principles, procedures and responsibilities relating to the use of force. For each mission, specific rules of engagement are drafted. Our troops in the field are required to implement their mandate with utmost professionalism, dedication and dignity, often at significant personal sacrifice. Unfortunately, Blue Helmets have been accused of acts of misconduct, including sexual exploitation and abuse. These reprehensible acts are an affront to the values of protection that UN Peacekeeping upholds. All acts of misconduct are unacceptable and forbidden. Click here for the UN Code of Conduct. The UN Peacekeeping Capability Readiness System (PCRS) aims to establish a more predictable and dynamic process of interaction between the UN Headquarters and Member States for strengthening readiness and timely deployment of peacekeeping capabilities with the right qualities. Level 1: A Troop Contributing Country makes a formal pledge for a unit and provides the list of major and self-sustainment equipment and certification of completion of basic training and human rights screening. Member States are encouraged to include the time frame of availability and duration of deployment for each pledged capability. Level 2: Based on the UN operational requirements, pledges at Level 1 can be elevated to Level 2 after an assessment and advisory visit has been conducted by a UN Headquarters team. Level 3: Following a satisfactory assessment, units which have achieved a reasonable degree of preparedness are elevated to Level 3. Rapid Deployment Level (RDL): Having reached Level 3, the Troop Contributing Country may pledge to deploy within 60 days following a request made by the UN Headquarters.